This quick tutorial will show you how to set featured products in WooCommerce and display them on a page using shortcode. 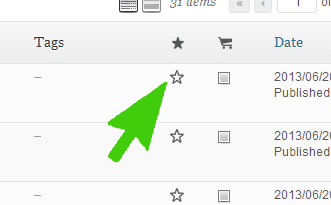 You will notice that on your list of products there will be some blanked out stars to the right hand side. Click on each star for each products you want to be featured. Insert the WooCommerce Featured Product Shortcode on a a page. Here’s an example using 5 featured products per page and 3 columns.